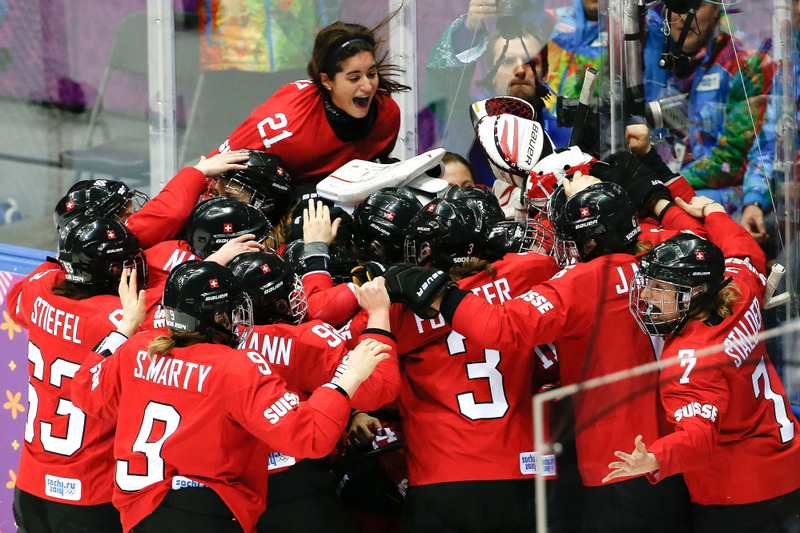 Switzerland rallied from a two-goal deficit, and Jessica Lutz broke a third-period tie with 6:17 to play. SOCHI, Russia (AP) — Jessica Lutz broke a third-period tie with 6:17 to play and Switzerland rallied from a two-goal deficit to beat Sweden 4-3 and claim the bronze medal in Olympic women’s hockey on Thursday. Florence Schelling made 28 saves for the Swiss, who earned their first medal in the sport that was added to the Winter Games in 1998. Valentina Wallner stopped 22 shots for Sweden. The United States and Canada were scheduled to play for the gold medal later Thursday at the Bolshoy Ice Dome. Sweden scored once in each of the first two periods before the Swiss tied it with 13:47 left in regulation on goals by Sara Benz and Pheobe Stanz. Switzerland made it 4-2 on an empty-netter with 67 seconds left before Sweden made it a one-goal game. The game was still tied at two when Lara Stalder saved the puck at the blue line and skated in before shuffling it over to the middle for Lutz, who flipped it past Wallner for the go-ahead goal. Aline Muller scored a full-ice empty-netter with 67 seconds left but, with the goalie still pulled, Pernilla Winberg cut it to 4-3 with 44 seconds left. Stuck in a preliminary group with the powerful North Americans and Finland, Switzerland was winless through the round-robin but won a quarterfinal matchup with Russia to make the medal round. A loss to Canada left the Swiss with a 1-4 record but a spot in the bronze medal game.